Most renown hubs of art and culture have an opera house as its crowning jewel: Vienna, Paris, and Sydney just to name a few. In my experiences opera houses feel antique, like a piece of ancient history. They often have elaborate grand staircases, marble, gilded sculptures, and intricate molding. 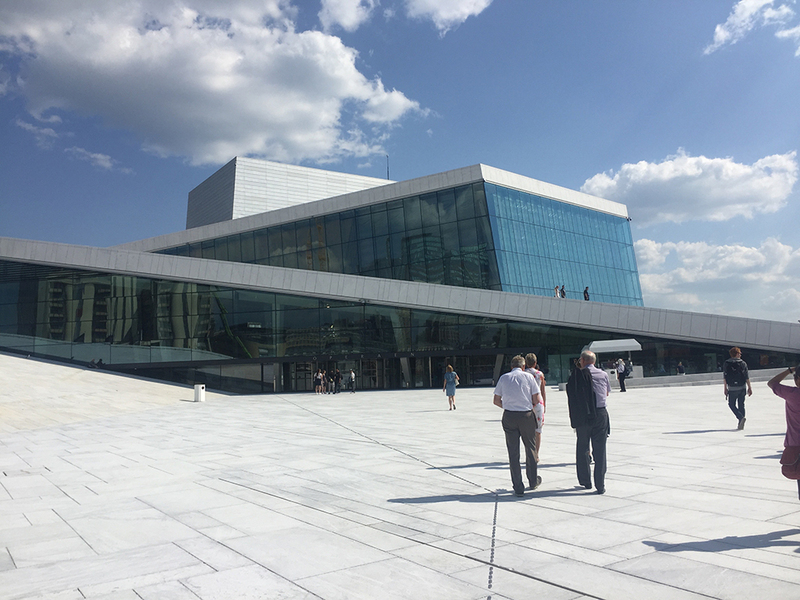 While the Oslo Opera House has some of these things, it situates itself among the world’s great opera houses in a very modern and unusual way. Designed by architecture firm Snøhetta, this stunning building is a beautiful contrast to its surroundings. Among large business buildings and a busy street, The Oslo Opera House is like a bright white sculpture at the edge of the water. A unique feature of this building that I have not previously experienced is that anyone is permitted to walk up the side of the building and onto the roof, or go straight down to the edge of the water in front. The angular white marble exterior is balanced on the interior with gentle curves and lots of wood, which, in combination with all of the light that filters in through the large windows, warms up the space both figuratively and literally. Still yet, there is much more to the building than meets the eye. Behind the scenes of what the general public gets to see, the building is like a beehive of dancers, workers, set builders, technicians, and everyone else that tirelessly works to perfect the amazing productions presented on one of their three performance stages. The only thing that could take experiencing this building to the next level is to, by some strategic thinking, score tickets to watch one of their sold out performances. We managed to get 4th row tickets to Alexander Ekman’s A Swan Lake. I’m sure when you hear “Swan Lake” you think of tutus, classical music, and ballerinas gliding across the stage on their toes, at least that was the mental image we were getting. If this mental image is something that you are into, then maybe the show isn’t for you. If dancing robots, cross dressers, rubber duckies, hair dryer electrocutions, and water flinging everywhere sounds more interesting to you, then you have found the perfect show. It is what I can best describe as a contemporary remix of the Swan Lake that everyone knows. Throughout the performance there was a mix of confusion and delight. Mix in some amazing choreography and costumes, and you have what we would consider a great night at an amazing production. The show mimicked the building by taking the expected and traditional and bringing it into the present in a way that is very unique to Oslo.